Iodine is a trace mineral that the body needs to produce thyroid hormones. Most people get iodine from fish, seafood, dairy products, iodized salt and red food dye #3, according to Entrust Medical Group. A low-iodine or iodine-free diet may be required for people undergoing certain medical procedures and individuals with an iodine intolerance or allergy. Protein foods that do not contain iodine include egg whites, fresh meats that have not been cured or processed, wild game and fresh poultry. 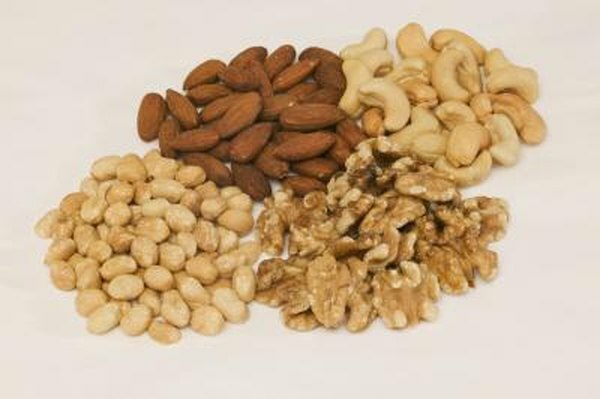 Vegetable sources of protein that are iodine-free include unsalted nuts and peanut butter, lentils and beans. No fish, seafood or dairy are allowed on an iodine-free diet. Unsalted pasta, rice, matzo and popcorn are all okay on an iodine-free diet. Homemade breads made with non-iodized salt that do not contain butter or margarine are also iodine-free. Be aware that most of the salt used in commercially prepared foods is iodized, so it is best to purchase salt-free/sodium-free cereals, crackers and breads. Most fresh and frozen fruits and vegetables and their juices do not contain iodine. The exceptions are spinach, broccoli, rhubarb, maraschino cherries and potato peels. Canned fruits like peaches, pears and pineapples are okay, but avoid canned and frozen vegetables with added salt, as these contain iodine. Soft drinks, coffee and tea made with distilled water, nut milk, rice milk, non-dairy smoothies, beer, wine and liquor are all okay on an iodine-free diet. Do not add cream or milk to coffee or tea, because they contain iodine; choose non-dairy creamer instead. Other iodine-free foods, according to Entrust Medical Group and the Thyroid Community, are dairy-free margarine, vegetable oil, sugar, cocoa powder, marshmallows, dark chocolate, sorbet, plain gelatin, raisins and hard candy.